This is an ex-library book and may have the usual library/used-book markings inside. This book has soft covers. In fair condition, suitable as a study copy., 650grams, ISBN: 9780764540691. New. Trade paperback (US). Glued binding. 359 p. Contains: Unspecified. For Dummies. This book is a great primer on robotics, and actually electronics in general. It also provides insight toward things like programming languages, electronic components (resistors, capacitors, etc.). However, some of the robotics kits worked with in the book are quite expensive (the PIC microcontroller, $60), but near-identical and cheaper alternatives (the PICAXE microcontroller, $3, or $20 for a starter kit) are easily substituted. 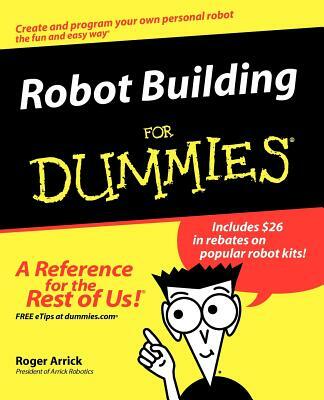 This book is fun to read and easy to learn from, and I recommend it for anyone who has ever been curious about how robots, or even DVD players, work at the electromechanical level, not just for beginners dead-set on building their very own robot.